Some of you have asked me what is making the tiny sand mounds on the greens during the day. The answer is two fold in what I have seen. The first is the Seed Corn Beetle. These beetles burrow about 2 inches into the soil, looking for insects and other tidbits to eat. 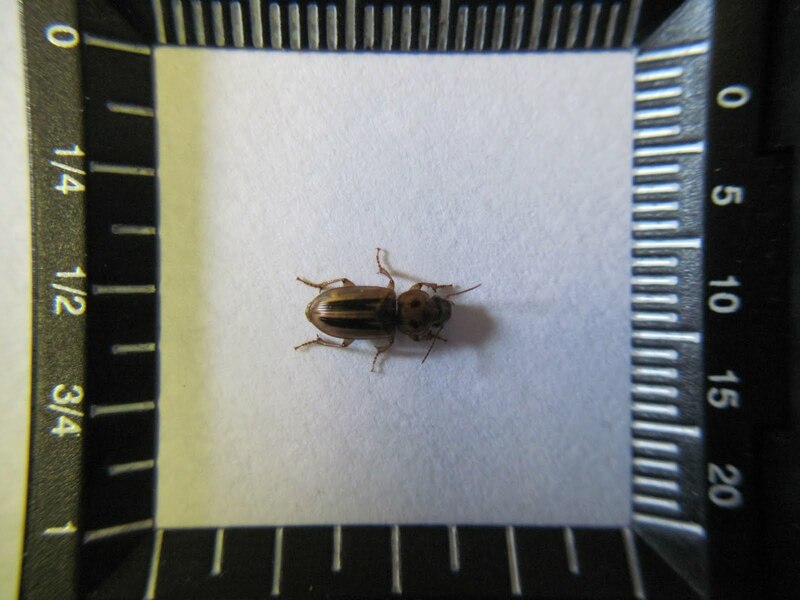 There are two generations of these beetles, occurring in May and in August. 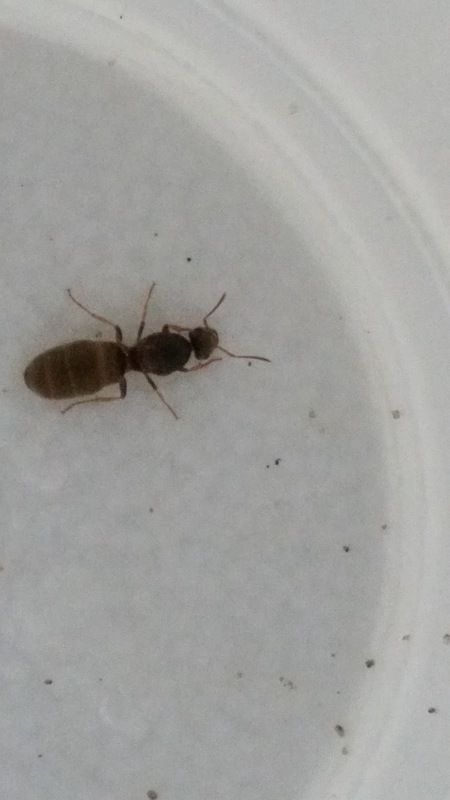 The second, and more populous burrowing insect I am seeing are ants, specifically the Eastern carpenter ant and the Cornfield ant. These ants are worker female ants looking to form new colonies with their burrowing. They mainly feed on seeds and honeydew from aphids and mealybugs. Normally treatment is not required, since both of these insects provide beneficial natural control of other pests to turf, such as the cutworm. We try to set high thresholds when it comes to evaluating whether to treat or not, to limit the footprint we set on the environment. 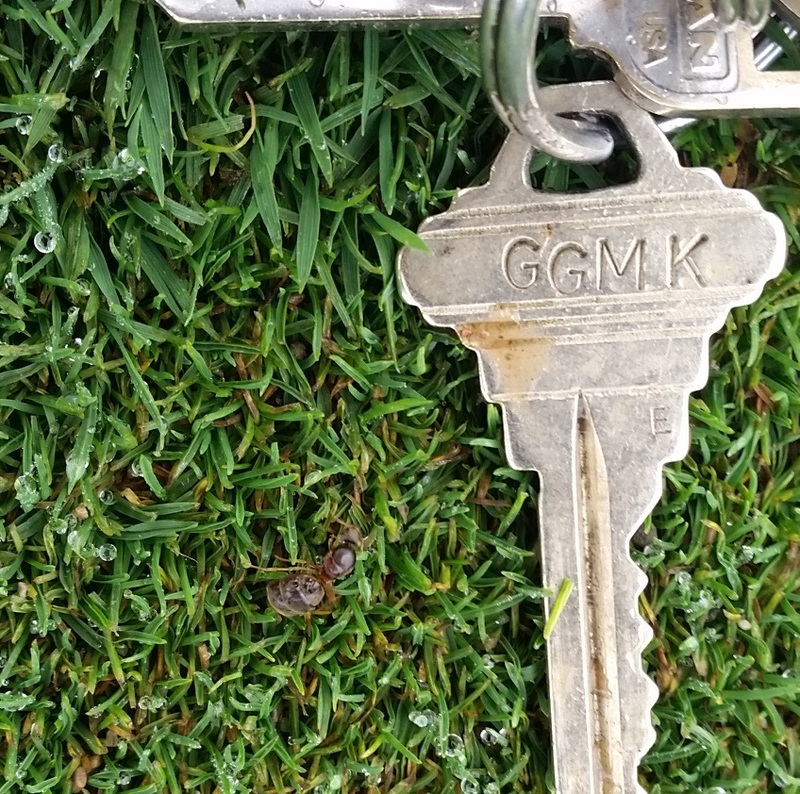 However, we will be treating for these ants today due to the high incidences of moundings on select greens. If you have any questions, please contact me at ryan@elconacc.com. Thanks, and have a safe and fun Labor Day Weekend! 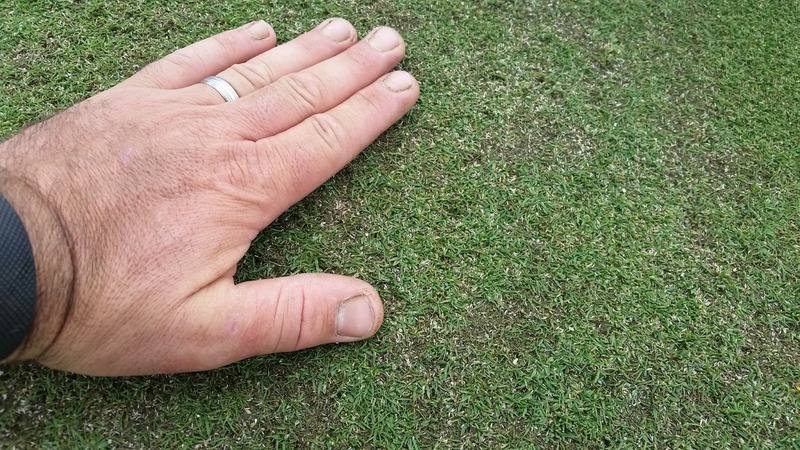 After a week of cooler weather, turf has begun to breathe a little easier and recover from July and August’s stretch of weather. 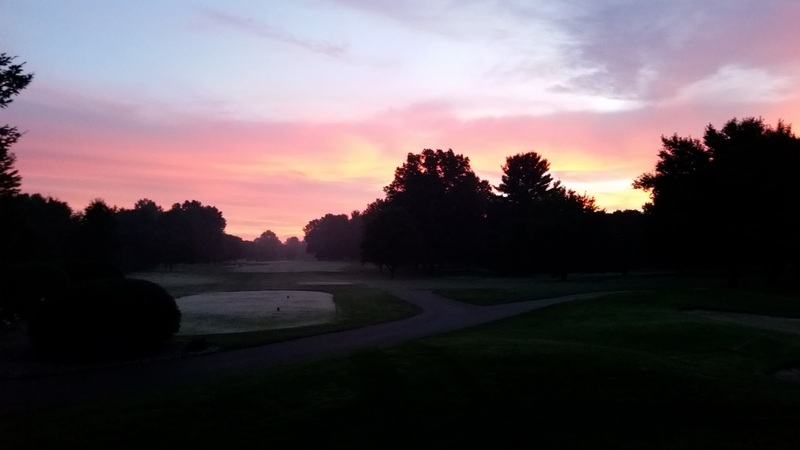 Club championship week is in full swing and hopefully most of you have taken advantage of a break in the rain to enjoy your golf course. 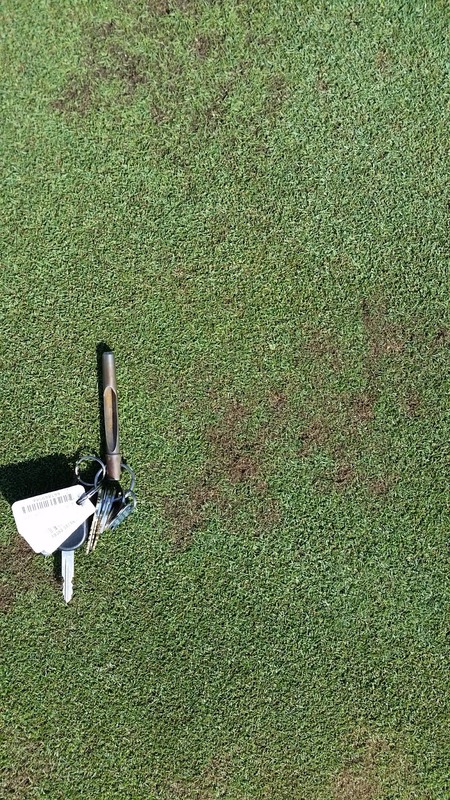 On the greens, rooting depth has increased in the last two weeks to an average of 2 inches, and they are turning color from brown to white, a good sign of a healthy plant. I have continued to see new shoots pop out of areas that were effected by Pythium Root Rot, which I wrote about here. While I mentioned that recovery will take some time in these areas, we have taken another proactive step to help aide recovery by hand seeding these areas. Below are some pictures of how this process works. 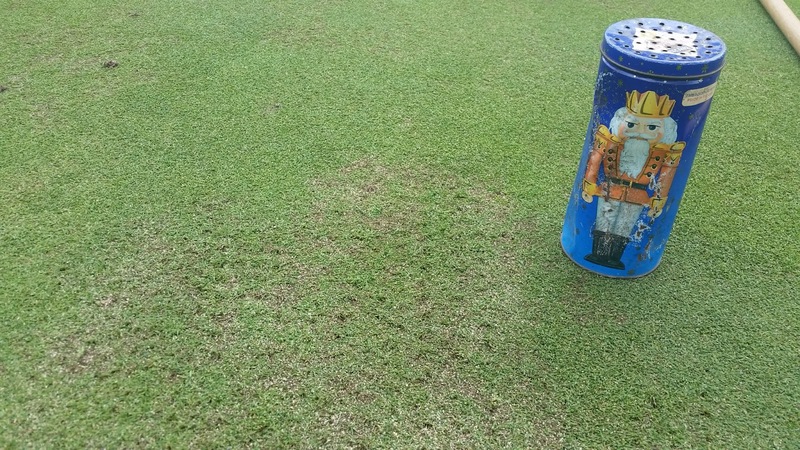 Further actions we will be taking include applying a light amount of granular fertilizer next week to help these areas grow in, and following Labor Day, a growth regulator application (normally applied weekly) will be skipped to further promote recovery. If you have any questions, please contact me at ryan@elconacc.com. I would be more than happy to discuss our recovery efforts with you. Have a great weekend! A brutal stretch of rain, heat and humidity is looking like it is coming to an end. Within the last week, the golf course has received over 6.5″ of rain, and more is pouring down as I write this. Many areas to the west of Elcona have received double the amounts we have, so I count my blessings that rainfall has not been greater. 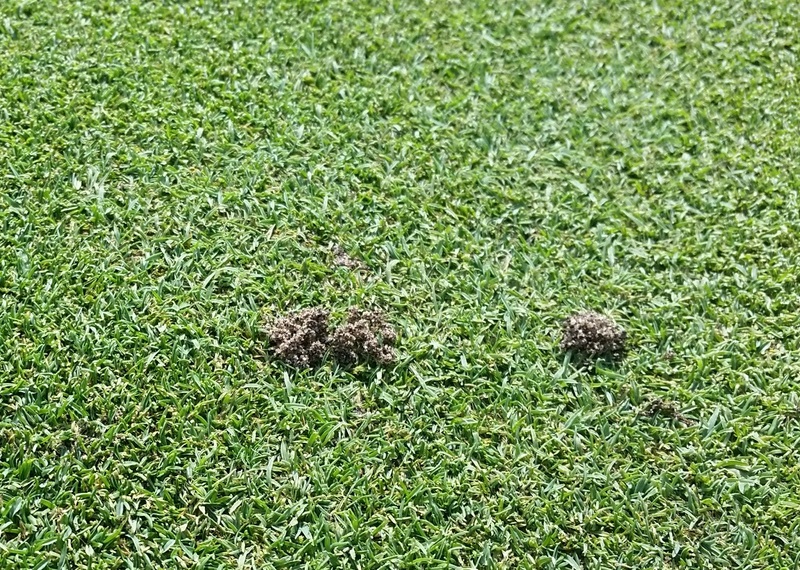 I would like to take a moment and explain what is causing what everyone is observing out on the course, mainly on the greens. Soil conditions now course wide are quite saturated and currently cannot handle even small amounts of water quickly. Combine these water logged soils with daytime highs in the mid to upper 80’s and heat indexes approaching 100 degrees, and it does not take long to create soil temperatures above 85 degrees. 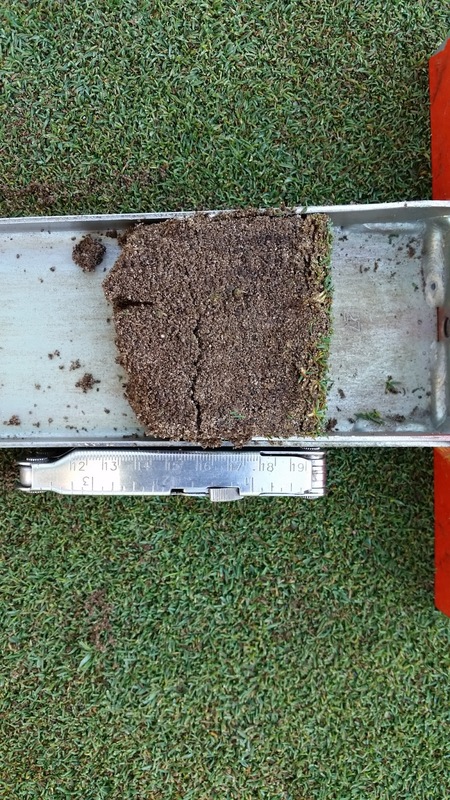 These conditions create prime environments for disease and turf struggles, as roots begin to die off and they do not come back until soil temperatures consistently stay below 80. 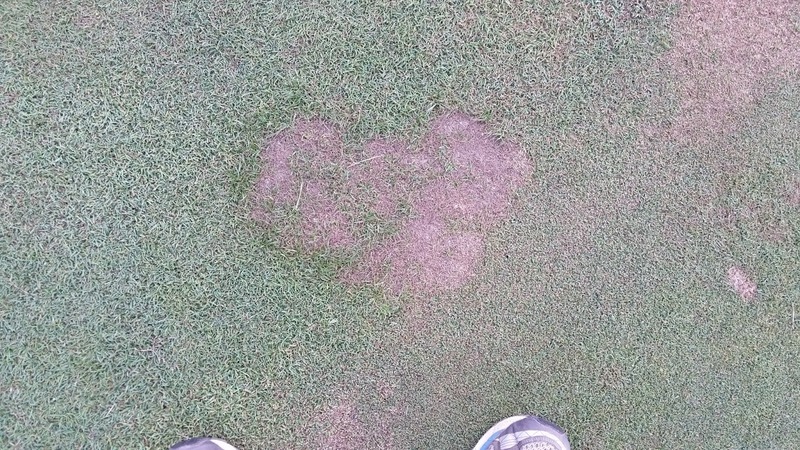 Roots and turf that do not die off are quite easily susceptible to fungal diseases. Canopy temperature on 2 green, one day after a 4.5″ rain event. This is not good! 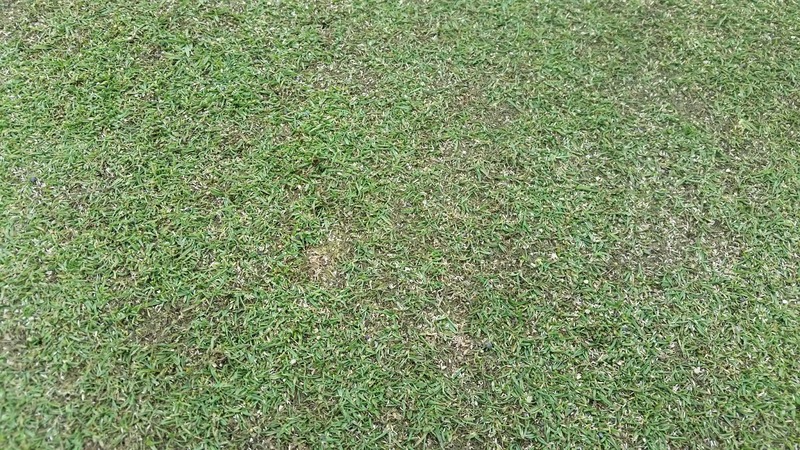 The brown areas of turf on some of the greens are areas that have succumbed to Pythium Root Rot. 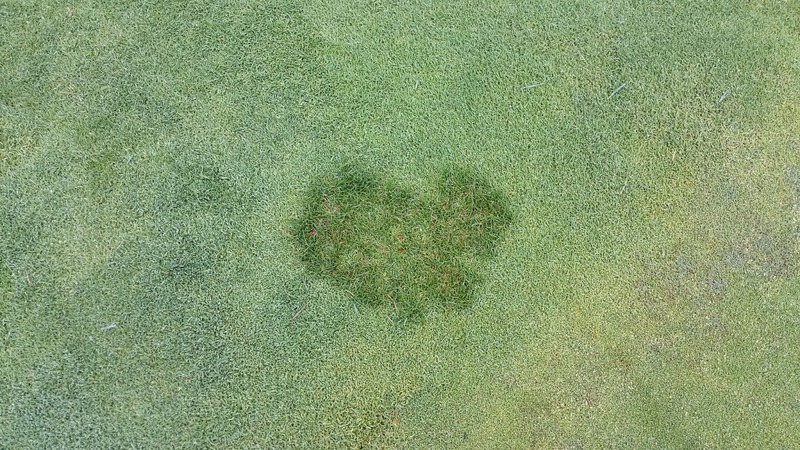 This disease affects mainly the creeping bentgrass in the greens, as the healthy Poa annua surrounding it depicts. 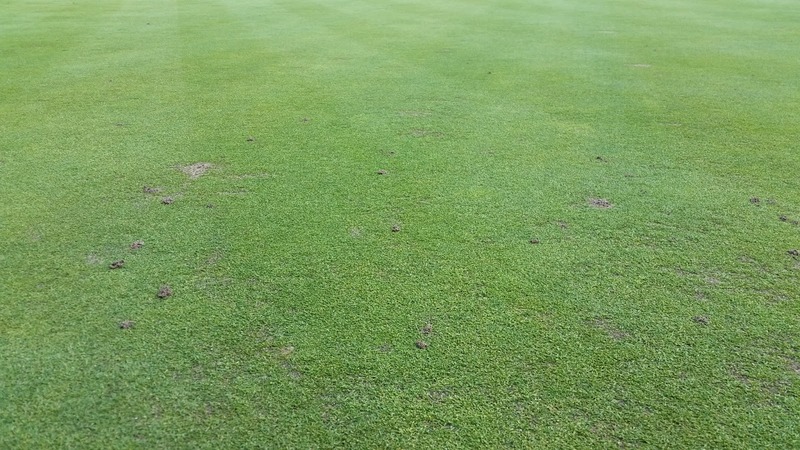 With the weather and extreme soil temperatures we have experienced in the last 6 weeks, extreme environmental stress has finally shown us the symptoms of probable infection that occur during late spring. 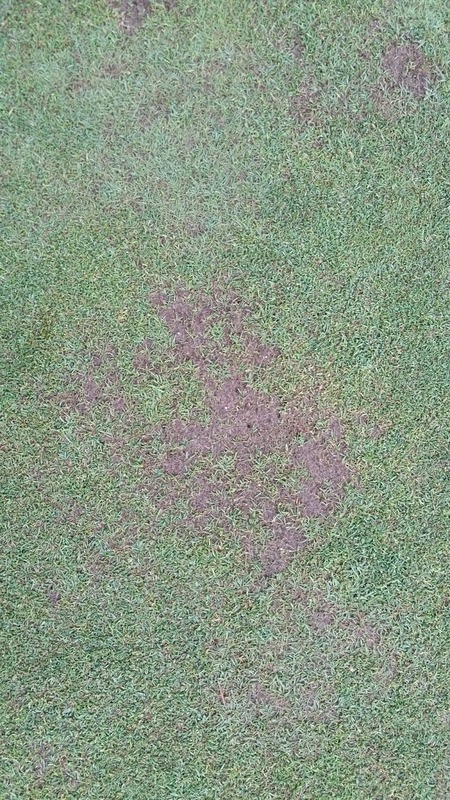 We have treated all greens twice with fungicides to combat this pathogen, and a third will be coming this week. 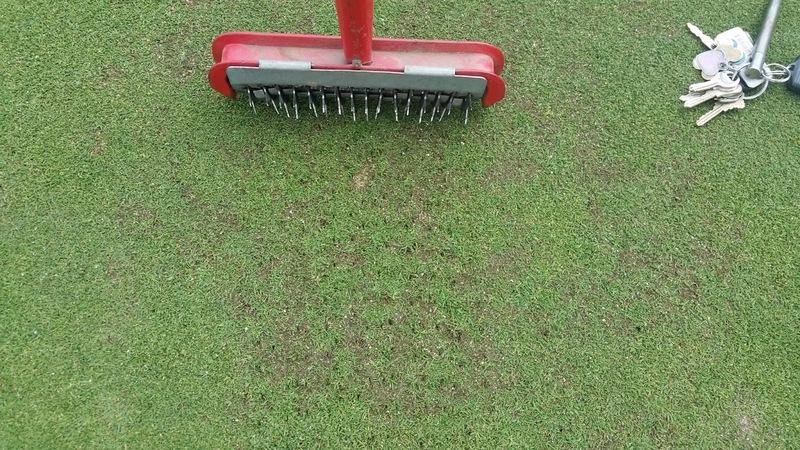 A regularly scheduled venting of the greens is also coming Monday, which will allow us to poke .25″ x 5″ deep holes into the greens surface to dry out the rootzone and allow it to drain better, as well as promote new rooting and replacing harmful carbon dioxide in the soil with fresh oxygen. The good news is that I am seeing new plant tissue emerge from many of these brown areas, a sign that the disease is in check and recovery is coming, which will be helped tremendously by the cooler weather coming this week. Please note that recovery will take some time in these areas. Any areas that do not recover will be plugged out from our nursery. We have two large bentgrass/Poa nurseries that were established mainly plugs taken from our greens. These nurseries are maintained exactly the same as the greens on the golf course and are an invaluable asset to have on hand. 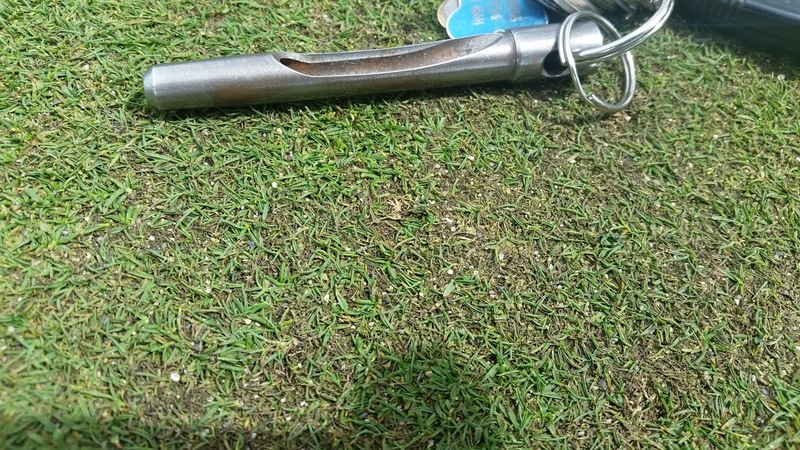 Many of the collar edges and higher trafficked areas around the greens have also succumbed to the extreme stresses and traffic that the last 6 weeks have brought. Populations of our old friend Poa trivialis (roughstalk bluegrass) that have emerged in the approaches have gone dormant from this weather. Again, I am seeing new plant tissue emerging from these areas, so recovery is ongoing. While I am not satisfied by any stretch with these current issues and conditions, the overall health of the golf course is good. 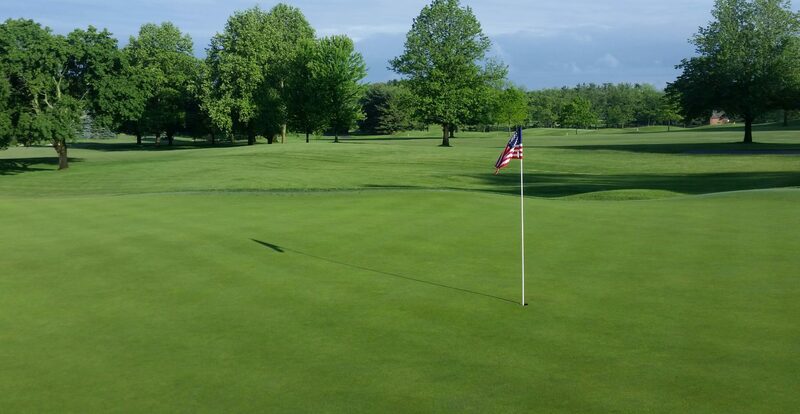 We will continue to be diligent with our maintenance practices to aid recovery and utilize all means available to return normal playing conditions as soon as possible. 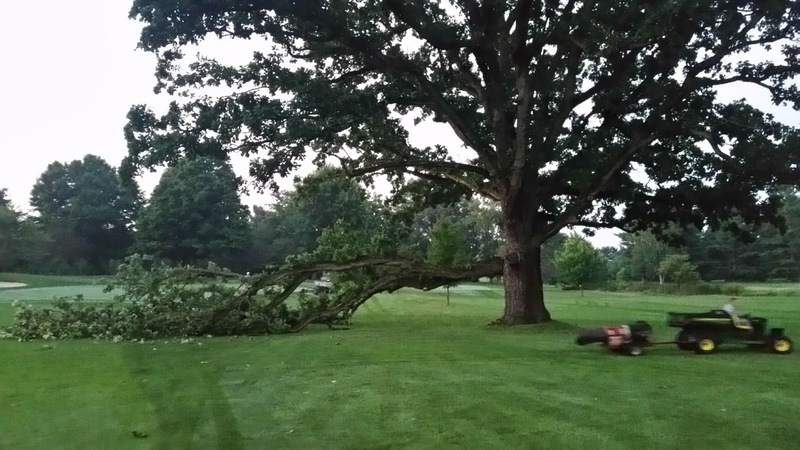 Finally, we lost a quarter of the large Burr Oak near 5 green (affectionately known as “Gus”) Saturday morning. This tree is estimated to be about 250 years old, and there are many cables that have been installed over the years to stabilize and balance its weight. This morning one of the cables snapped, causing the southeast part of the tree to fall. It has since been re-cabled and stabilized, but the area will be roped off to cart traffic for the time being. If you have any questions, or would like to discuss the topics I mentioned above with me, please contact me at ryan@elconacc.com, or call me at my office. I am more than happy to discuss and explain what is happening on the course with you. With the recent stretch of heat and humidity, the greens have been showing signs of stress and the need for some recuperation. Canopy temperatures have hovered near 105-110 degrees, this means that it is time for us to play defense! To allow the turf the chance to recover and grow new shoots, we are venting all greens this morning, and temporarily raising the mowing height of cut from .125″ to .130″. Rolling will be reduced as well to further limit traffic damage on this turf. Our staff will be out as often as needed to check for any signs of wilt, and syringing on a regular basis to cool the turf. 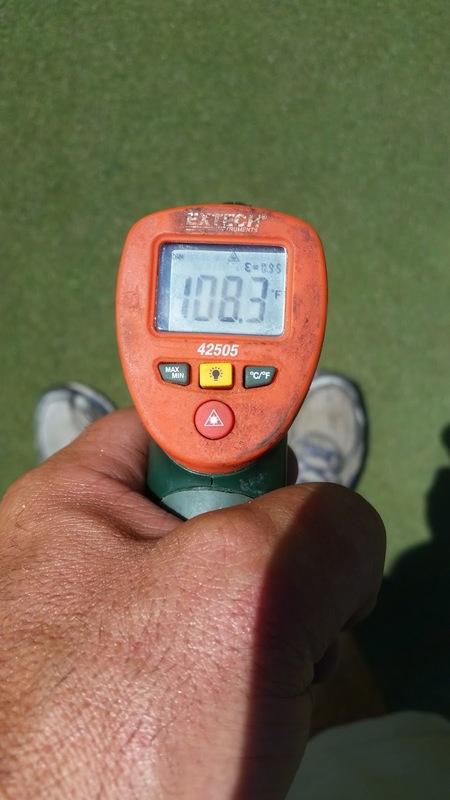 Canopy temperature on 1 green. Hot! 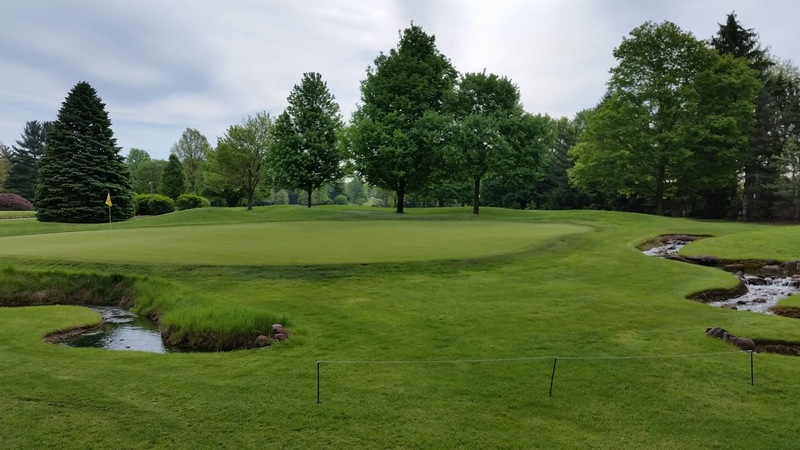 This will lead to a temporary reduction in green speed, but will also allow for the turf to generate new leaf tissue to better generate the energy it needs to survive. Given that the forecast this week calls for more heat and humidity, this is the best course of action to reduce stress on this turf and allow these areas to recover. My goal is to return mowing heights back to normal as soon as these areas show sufficient healing and recovery and when the weather returns to more seasonable conditions. If you have any questions, please contact me at ryan@elconacc.com. I appreciate your patience and understanding with this matter. Have a great week!